Get your hands on Elton John's designer clobber! Get your hands on Elton John’s designer clobber! 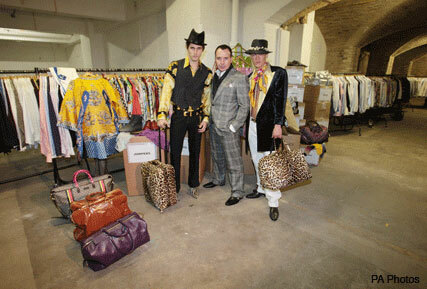 Elton John and David Furnish are clearing out their closets this weekend – all in the name of charity. The megabucks duo open their wardrobe doors once every five years, and hold one serious second-hand sale – to benefit the Elton John Aids Foundation. The pop-up shop, called Out of the Closet, will be open in Covent Garden tomorrow for one week only – and will include everything from Elton’s stagewear, to David’s favourite shirts. And with prices ranging from £10, to a whopping £2,000, there’s something to cater for every budget. Brands on offer include Versace, D&G, Alexander McQueen, Prada and Dior – to name but a few – with everything from clothing, accessories, sunglasses and luggage available for the public to browse. Plus, it might be worth having your celeb-spotting hat on – as previous guests to the pop-up shop include Elle Macpherson, Natalie Imbruglia and Liz Hurley. With the store raising £400,000 for the charity back in 2002, we reckon it’s a great place to pick up some one-off Christmas pressies! Out of the Closet will be open from 12-19 December. The shop will be restocked daily. Out of the Closet, Flower Cellars, 8-12 Russell Street, Covent Garden, London WC2.